Lindsey Bryan is a recent graduate from the Cleveland Institute of Art with a BFA in Illustration and a concentration in Creative Writing. She currently works for American Greetings, writes and illustrates her own children’s books, and freelances on the side. She loves to illustrate animals, especially pets (which makes her purr-fect for this project!). Lindsey enjoys stylizing people’s pets in a way that exemplifies their cuteness in a traditional yet trendy aesthetic. 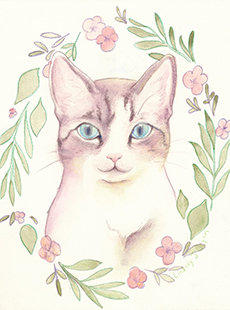 Lindsey’s hand-drawn illustrations are available in four sizes from 4″ x 6″ to 10″ x 12.” Images are colored with watercolor in addition to linework. 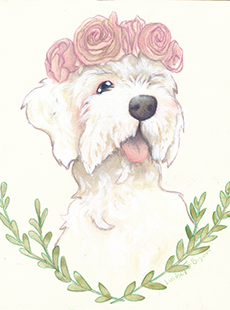 Pet owners can specify on the order form if they would like flower wreaths around the portraits, flower crowns on their pet’s head, or even banners with the pet’s name hand lettered on them. Each commissioned portrait takes about six to eight weeks to complete, and is completely original, based on the photograph that you provide. Artist signed.